It has finally come done to the last week of classes and I am super excited. Yesterday was the last day of projects for me which means all i have left is one annoying final. Happy, happy, happy. This also means that this weekend i can go out and shoot as much as i want wihtout the thought of having to get back early for school work. 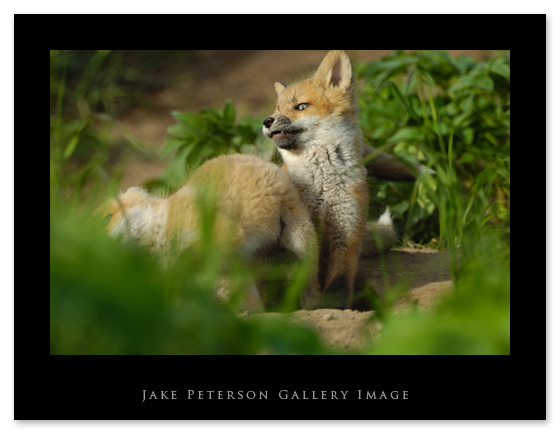 I thouhgt i would share my excitement by posting this shot of a couple Red Fox pups at there den up in Alaska. They were very playful one evening and between the bear shooting Dad and I were doing, we photographed them. They were amusing, quite a challenge to keep a straight face while watching them play. Even now while writing this i can seem them jumping on mom wanting here to play too.